End-user documentation for B2FIND, the EUDAT metadata service. Metadata are important whenever research data are intended for serious use. In addition to being essential for understanding an individual dataset, systematically structured metadata are also a key element of data infrastructures, such as searchable catalogs of data, or automated systems for mapping and analysis. The EUDAT metadata service B2FIND addresses these requirements by providing a comprehensive joint metadata catalogue and a powerful discovery portal. 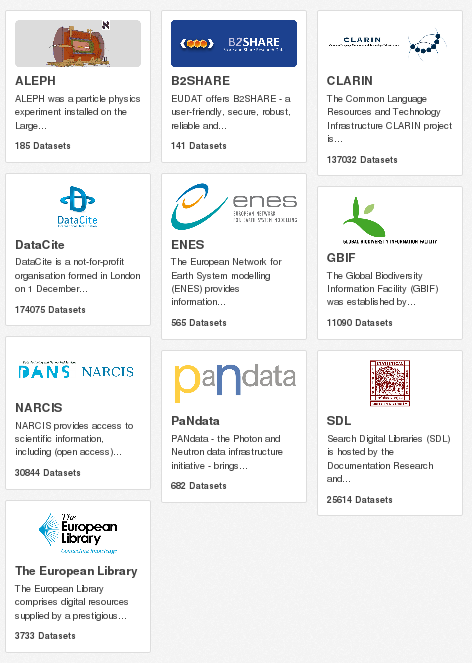 Metadata stored through EUDAT services such as B2SHARE are harvested from various research communities overarching a wide scope of research disciplines. The B2FIND portal and API provide the user with advanced search functionalities and allow access to the data resources behind the metadata found in the catalogue. Please watch our brief B2FIND video, which explains the capabilities of the service. Researchers or end users who want to search and access research data: Please read the section "How to find and access data using B2FIND" and/or the online Search Guide. 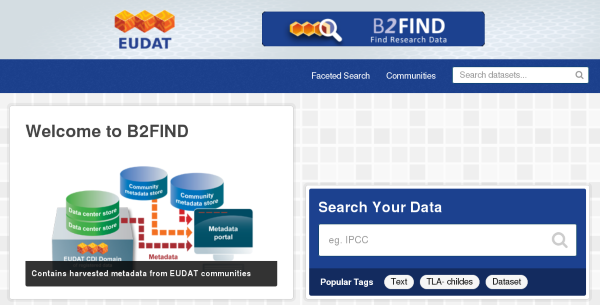 You can use the B2FIND discovery portal available from http://b2find.eudat.eu. Communities and other providers of research data who are interested in publishing their metadata in EUDAT: Please read the section "How to publish metadata in B2FIND" and contact us via the webform. Via a graphical, web-based tool, available at http://b2find.eudat.eu, which is designed to be self-explanatory. Using a command line tool based on the API interface to the portal. These modes of use are described in detail in our B2FIND Usage page. Figure 1. The EUDAT B2FIND service main screen. By entering text in the provided free text field "Search your data" you can perform a full text search over the whole catalogue directly from the home page. A service for providing and transfering the metadata. The definition of a community specific mapping. The B2FIND entry page lists all communities that provide metadata under 'Communities'. In order to publish metadata, please follow the details under the B2FIND Integration page. The page lists the metadata formats supported by B2FIND and the metadata definition of the B2FIND schema. Metadata that are made searchable in B2FIND are harvested from metadata providers using the standard OAI-PMH interface. The community itself decides which metadata are made available to EUDAT and how their metadata elements are mapped to EUDAT-specific facets. A sophisticated framework ensures that metadata from various providers are harvested regularly to display complete and up-to-date information. This framework also provides the translation from the community metadata schema to standard facets in the B2FIND metadata catalogue. You can also find hands-on training material on B2FIND on our github repository.